What are Material Design and Material Components for the Web? For desktop and the mobile web, Material Components Web (MDC Web) unites design and engineering with a library of components for creating consistency across apps and websites. As the Material Design system evolves, these components are updated to ensure consistent pixel-perfect implementation and adherence to Google's front-end development standards. MDC is also available for Android, iOS, and Flutter. In this codelab, you'll build a login page using several of MDC Web's components. 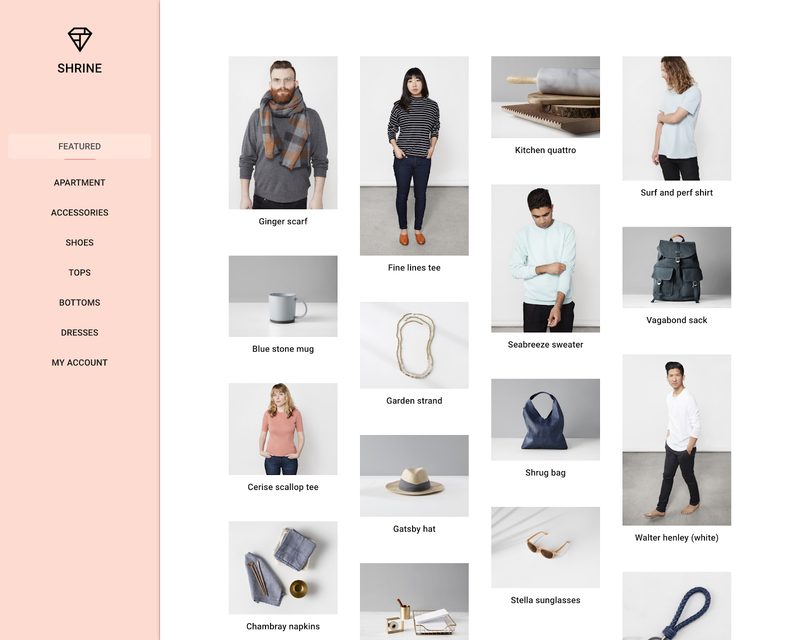 This codelab is the first of three codelabs that will guide you through building an app called Shrine, an e-commerce website that sells clothing and home goods. It will demonstrate how you can customize components to reflect any brand or style using MDC Web. In this codelab, you'll use the default components provided by MDC Web. You'll learn to customize them in MDC-103: Material Design Theming with Color, Shape, Elevation and Type. How would you rate your level of experience with web development? The starter app is located within the material-components-web-codelabs-master/mdc-101/starter directory. Be sure to cd into that directory before beginning. Note the -master suffix in the name of the root directory. If you are downloading the starter app from the button above, please append the -master suffix whenever the root directory is referred to for the rest of this codelab. MDC Web uses a CSS preprocessor called Sass. If you're using a different CSS preprocessor (or none at all), that's OK! You can use Sass alongside your current preprocessor by installing the sass CLI or using a plugin (for example, sass-loader for Webpack, gulp-sass for Gulp, or grunt-sass for Grunt) in your build toolchain. We'll be using webpack to bundle our files and to locally serve our site. The webpack configuration for this project has already been set up for you in the webpack.config.js file. For more details on how it was configured, see the Getting Started guide. It's helpful to run npm start in a separate terminal tab or window, so the local server can be kept running while we're modifying the code. The webpack-dev-server will start. Point your browser to http://localhost:8080/ to see the page. If you were unable to run npm install or npm start successfully, stop and troubleshoot your developer environment. Success! 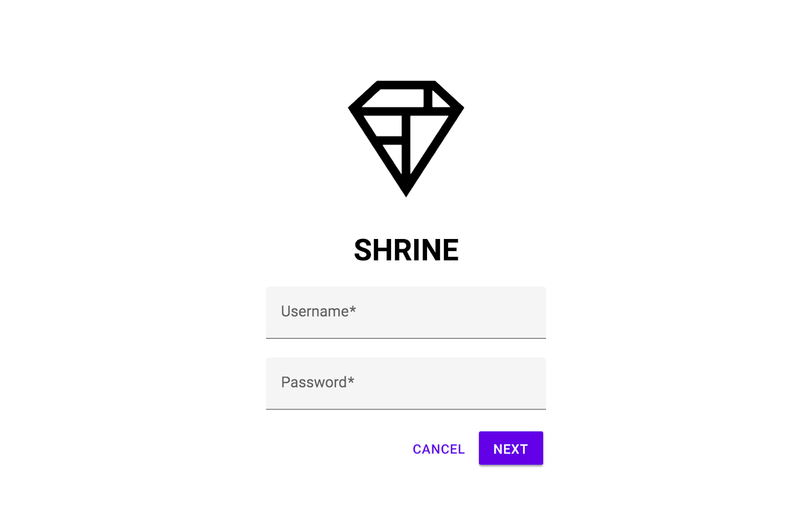 The starter code for Shrine's login page should be running in your browser. You should see the name "Shrine" and the Shrine logo just below it. Here, a <link> tag is used to load the bundle-login.css file which was generated by webpack, and a <script> tag includes the bundle-login.js file. In addition, we include normalize.css for consistent cross-browser rendering, as well as the Roboto font from Google Fonts. MDC Web components are styled using Sass, an extension language for CSS. Sass is compiled into regular CSS using webpack. The Sass files in MDC Web are written in syntax called SCSS, and have file extensions ending in .scss. In general, it's recommended that you make custom style modifications to components using your own classes. 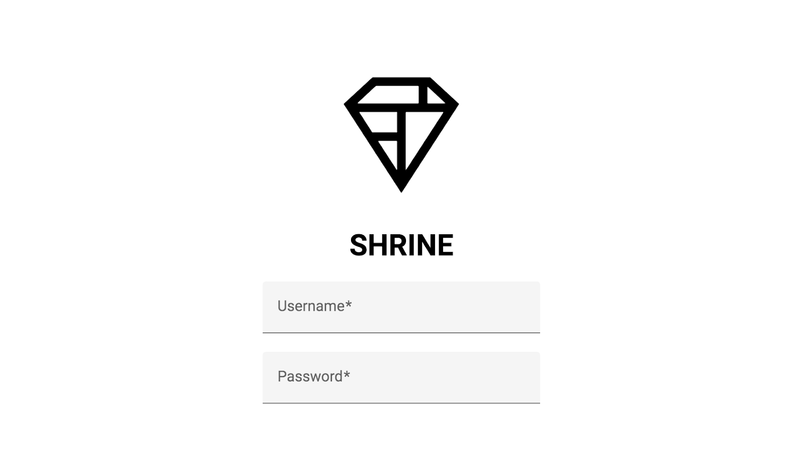 You might have noticed some custom CSS classes in the HTML above, such as shrine-logo. These styles are defined in login.scss to add basic styles to the page. You might have also noticed home.scss and home.js. These will be used in codelab MDC-102, and can be ignored for now. To begin, we'll add two text fields to our login page, where people will be able to enter their username and password. We'll use the MDC Text Field component, which includes built-in functionality that displays a floating label and activates a touch ripple. Material Design text fields have been greatly enhanced to improve brand flexibility, with improvements backed by extensive user experience (UX) research for better usability and visual design. Learn more about the improved text fields in the article in the Material Guidelines. See more information on using the master MDC Web package here. Note: The double underscore (__) and double hyphen (--) in these selector names come from the BEM pattern, a method used to semantically structure CSS classes. MDC Web follows a modified version of this pattern, as shown in this codelab. Text Fields express if the field input is valid or contains an error, by using attributes provided by HTML5's form validation API. Set the minlength attribute of the mdc-text-field__input element of the Password text field to "8"
Refresh the page at http://localhost:8080/. You should now see a page with two text fields for Username and Password! MDC Text Field uses a native HTML <input> element, so it can be used with native <form> elements in HTML. The MDC Text Field reflects hover and focus states automatically. The MDC Text Field includes many features and style variants, such as helper text, icon pairing, an outlined style variation, and a textarea. Check them out here! Next, we'll add two buttons to our login page: "Cancel" and "Next." We'll use the MDC Button component, along with the MDC Ripple component, to complete the iconic Material Design ink ripple effect. For the "Cancel" button, we're using the default button style. However, the "Next" button uses a raised style variant, which is indicated by the mdc-button--raised class. To easily align them later, we wrap the two mdc-button elements in a <div> element. Because we don't need to retain a reference to the ripple instance, there's no need to assign it to a variable. That's it! Refresh the page. An ink ripple will display when you click each button. There are many other style variants of the MDC Button, such as unelevated and outlined. Check them out here! Fill in the text fields with valid values, and press the "NEXT" button. You did it! You'll continue working on this page in MDC-102. Note: For the purposes of this exercise, the form submits via HTTP GET, and there is no server-side processing. Any production site or application would use HTTP POST (by adding method="POST" to the <form> element) to submit to a server endpoint and verify login information. You can test your version of the page against the page in that directory. Don't forget to run npm install in that directory first. Text Field, Button, and Ripple are three core components in the MDC Web library, but there are many more! You can also explore the rest of the components in MDC Web. You can head over to MDC-102: Material Design Structure and Layout to learn about the navigation drawer and image list. Thanks for trying Material Components. We hope you enjoyed this codelab!